A great copywriter has a firm understanding of the target audience they are writing for, and how they should best style their text. They also understand that the sort of copy they write will depend largely on the format in which it is presented. What this means is that there is no straightforward answer for how to write the best copy, as it depends entirely upon who will be reading it and under what circumstances it is needed. So, to help give you a thorough understanding of what constitutes good copywriting, here are some examples taken from a number of different uses. The landing page is an integral part of any website as it needs to quickly draw the visitor in and give them a reason to keep exploring your site. The text needs to demonstrate your brand and very concisely lend enough information to intrigue them and leave them wanting more. Grammarly isn’t just a great tool for writers, it’s also an excellent example of crafting landing page copy that creates a sense of need. First and foremost it adheres to the first rule of sales writing by putting the reader at the heart of the content, with an emphasis on ‘you’ and ‘your’ over ‘us’ and ‘we’. The content also leads with the benefits (saving users from committing grammatical faux pas) and emphasises its USP as going ‘beyond the basic spell check’, being able to be integrated into a range of other services. Along with a strong, snappy active voice, Grammarly’s offering is compounded by a reference to its team of leading linguistic authorities and testimonials from high-profile users. All this culminates in the solid call to action to ‘join more than 10 million happy Grammarly Chrome users today’…for free. On top of that, its design uses graphics to progress the argument and highlight how the product works without the user having to take any action such as clicking on a video. One of the most important parts of any website’s copy is the FAQ section. Before making a purchase, most customers will visit the FAQ as it summarises the important aspects of what they are about to purchases, and answers any crucial questions. All answers need to be concise, professional and to properly address any concerns the customer has. 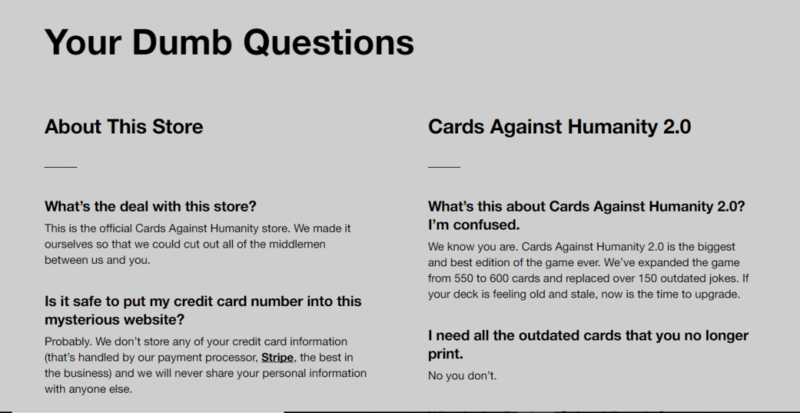 Card Against Humanity is perhaps one of the greatest examples of a site that knows their customer to a tee and used that knowledge to target their prose in a unique and humorous way. Their FAQ section is perhaps the best example of this, whereby all answers are in some way comical, and at least a little offensive. It may not suit everyone’s taste, but it certainly suits that of their customers. Social media is a powerful tool that any business can use to build a following of loyal customers and it’s no surprise that many organisations now turn to professional copywriters for their posts. Here is an example of good copywriting from a company that is leading the way in great corporate social media. Innocent are well renowned for their strong performance on social media. They post regularly on Facebook, Twitter and Instagram and often combine powerful imagery with simple two-line quotes. They continuously find a way to be humorous and young, and they have used this great copywriting ability to accumulate millions of followers across all accounts. Check out their reply to a fan’s comment, they even put witty thought into seemingly pointless responses. Much of the time, you will land on a website via Google or from a link someone sent you and you simply want to find out more about who created the site and why. In such a case, great copy from “about” pages are able to demonstrate not so much what you do, but why you do it and why people should trust what you have to say. MAG (Mines Advisory Group) have a mission to save the lives of innocent people who live in war-torn areas where mines are still a huge risk to their daily lives. This section of their about page helps to paint a very vivid story about the risks that people face. The copy is clear and to the point, but really touches your heart by drawing out the fears that such people face every day. In just one page of text, you understand what MAG do, and you are left wondering how you can get involved and help out. Getting people to view what you have to sell is just one part of the battle. The other part is convincing them that what you are offering is worth paying for and will bring them added value. This is where compelling product descriptions come in. Brew Dog produces speciality craft beers that they claim are above and beyond all the typical bar lagers and ales. To catch their readers’ attention and show that what they offer is unique, they have clearly put great care into each one of their product descriptions. Every item sounds rebellious and interesting and any craft beer lover would be keen to give one a try. Captivating blogs that appeal to your audience are a fantastic way of staying in touch with your readers and offering added value after a purchase. They are also great for attracting new audiences via SEO, and great copy is vital in showing you offer quality content and making them want to learn more about you. One of the best examples of good copywriting comes from The Blonde Abroad who is a female travel blogger. Within the last 5 years, she has managed to build one of the most popular travel blogs in the world. 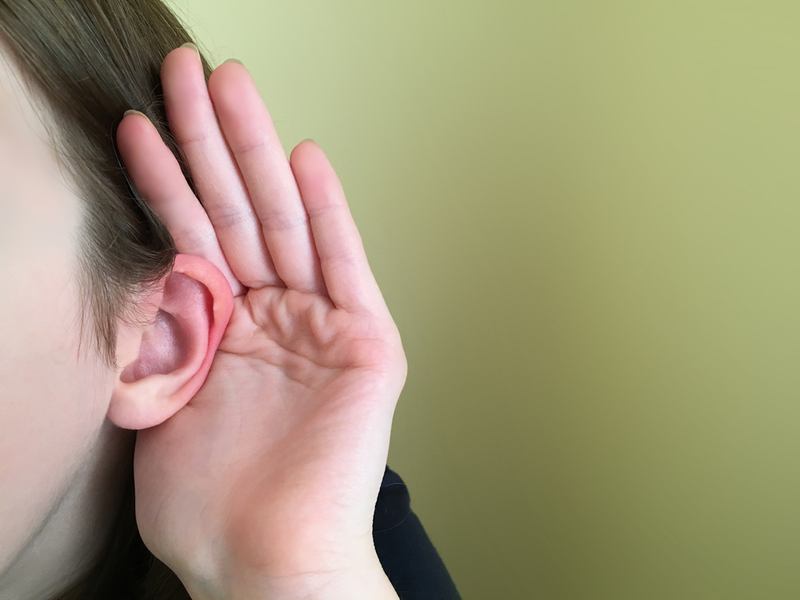 Getting to the top of such a competitive niche means understanding your audience and providing useful, interesting information in a clear manner. Such great blogs mean more people follow her on social media, which in turn means she has a greater reach the next time she writes and publishes a post. Kiersten puts much of her success down to having found her voice and a way of speaking that resonated with her intended audience. These examples of good copywriting demonstrate the power of great text, used for a number of different purposes. If after reading this you’ve decided your site could do with some updating, or that you need help finding the “voice” of your site, it may be time to hire a professional copywriter. Great copy has the power to display your brand in a far more positive light and can attract a lot more customers than boring straightforward text possibly could. Copify offers copywriting services for all manner of different needs, so get started by viewing what’s on offer here.